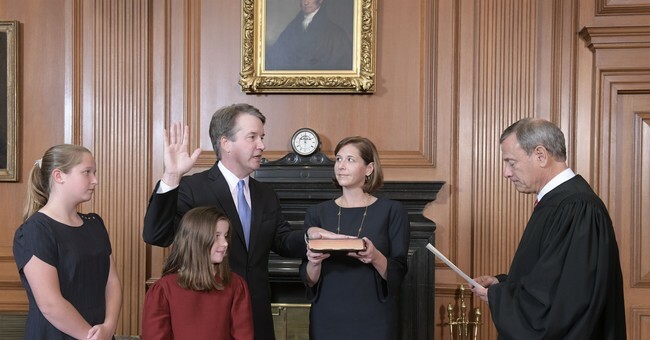 The confirmation of Brett Kavanaugh to the United States Supreme Court: what a victory! This win for the Republican majority, for President Trump, and for the nation as a whole should inspire conservatives going into Election 2018. However, the criminal antics leading up to his success should encourage steps to prevent such an outrageous circus from happening again. President Trump’s leadership inspired courage and conservatism among a Republican U.S. Senate caucus which had routinely acquiesced to the other side many times rather than fight back. When Republicans fight, they win. They should consider doing more of it. During the 2010 Tea Party wave, a number of Republican incumbents lost their seats in primaries (and Murkowski almost lost hers) because they did not fight for conservative values and fight back against the Democratic Party. Even flakey U.S. Senator Jeff Flake stood up for the team in his final year in the Upper Chamber. Initially, his request for one more FBI investigation seemed like craven, Never-Trump cowering—anything to screw over the President who had shamed him for his liberal views on borders and national economic interests. Looking back on the 50-48 confirmation victory, Flake’s qualifying motion makes sense. The seventh investigation fully exonerated Kavanaugh beyond reproach, and it offered President Trump the opportunity to prove his commitment to a transparent process. Finally, the investigation provided necessary ballast for U.S. Senators Susan Collins and Joe Manchin to vote for confirmation. And then there’s Collins. Never have I been so proud of a GOP moderate. Collins has been a 50-50 member of the upper chamber for the last two decades. She voted against Obamacare, but she still voted for Planned Parenthood. This time, she took the bold step of believing Kavanaugh because the accusers and their spurious evidence failed to convince her to withhold her vote. She confirmed not just Kavanaugh, but everything that makes our judicial system great: presumption of innocence, thorough investigations; a commitment to believing the facts, not one’s feelings; and finding the truth rather than promoting a political outcome. On a larger note, the Alinsky-Obama-Clinton machine of mob-ocracy and muggery failed big time. Before becoming President, Barack Obama’s only real job had entailed community organization and academia (if one can really call those efforts “work”). He intended to remake the United States into a socialist endgame first through his executive actions, and then with an expanded network of social justice warrior activist groups. Organizing for Action is still active, and big money from left-wing donors like Tom Steyer, George Soros, and Michael Bloomberg is pouring into national and statewide efforts. But they hit a big wall of conservative resolve. The stakes were too high for Republicans to let this confirmation slip away. This victory is a big win for Kavanaugh the man, not just the justice. What incredible fortitude we saw in this jurist. His selection is a big victory for Trump’s political instincts, too. He chose a candidate with a long judicial record. Trump likely foresaw the worst political machinations from the Democrats, and Kavanaugh stood up to them, shaming the disgraceful antics of the Democratic Party, who callously fundraised of this debilitating conflict to shore up election prospects in 2018 and 2020. Democrats don’t understand that conservatives not only understand the corrupt games that liberals play, but now they know how to fight back and win. There are causes for concern going forward, and those issues were laid out early in this confirmation process. In his opening statements at the Judiciary Committee hearings, U.S. Senator Ben Sasse announced the causes behind the SCOTUS Circus which erupted at the Kavanaugh hearings. Congress is not doing its job to pass meaningful legislation, but is turfing its authority to fourth branch bureaucracies or leaving considerable policy outcomes to the United States Supreme Court. The court of last resort has become too powerful, taking on a super-legislative role in our republican form of government. Their role in federal and even state politics needs to be scaled back. It’s time to review judicial review, rethink Marbury v. Madison. Should the Supreme Court have the final say on whether legislation withstands constitutional scrutiny? Congress has the power to limit the size and scope of the judiciary’s power. Doing so would decrease the increasingly partisan wrangling which has strangled the nomination/confirmation process. Last of all, yes indeed the U.S. Senators stood up to the mob of abusive left-wing agitators. Yet if the United States Constitution is to serve as the final guide for our legislature, we must remember the Framers’ original vision for the United States Senate. The upper chamber was never supposed to be a popular chamber, i.e. elected by the people of the several states, but rather selected by the legislatures. Fake news and progressive propaganda induced the passage of the 17thAmendment, which created the direct election of Senators. The argument for repeal of the 17thAmendment may be difficult to make. However, as the country becomes more conservative, concerned about federal overreach at the expense of individual liberty and state sovereignty, a “Repeal the 17thMovement” can take shape. Once enacted, the U.S. Senate can be restored as a deliberative body immune to mob rule and ensure a respectable process for confirming Supreme Court justices and other executive officials. For now, the country (and conservatives in particular) can bask in this incredible legal, moral, and political victory. Let’s hope that our leaders learn from this process and take steps to reform it in the near future.